Zigmund Kermish is an associate research scholar at Princeton University. Wait, why am I in Antarctica? I realized I’ve not yet written a blog post explaining why my experiment is in Antarctica. Things are temporarily quiet on the Ice while we’ve been waiting for the SPIDER cryostat to cool down, so now’s a good time to make the attempt. sit at about 5,200 meters above sea level) and the South Pole (where the South Pole Telescope, the KECK array, and this year BICEP3 operate at 2,800 meters). Of course, one can always go beyond terrestrial limits. With a big enough budget and enough time to develop the project, you can launch a dedicated satellite mission to eliminate the atmosphere all together, achieving dramatically improved individual detector sensitivities. 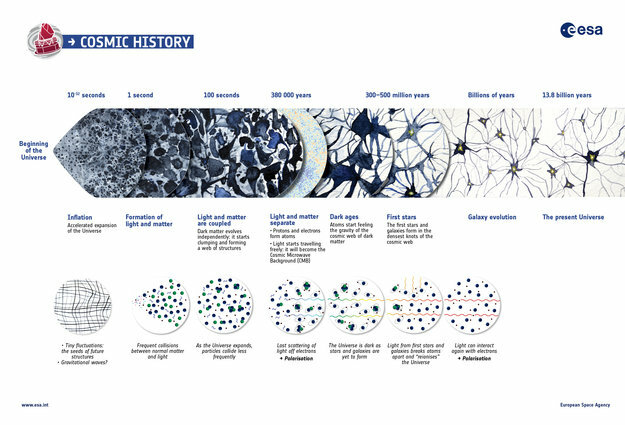 Historically, satellite-based instruments have provided the definitive measurements of various aspects of the cosmic microwave background (the faint signal left over from the Big Bang), but they usually build upon the groundbreaking discoveries made closer to Earth. These discoveries have been made from the ground and from one other platform: balloons. Balloon-borne instruments have one big advantage: they allow us to get above nearly all of the atmosphere, approaching the detector sensitivity of satellite-based instruments at a fraction of the cost of a satellite mission. This increased detector sensitivity has two advantages: you can observe a larger fraction of the sky for a significantly shorter amount of time and still get a higher fidelity map than what you can do from the ground (observing for days rather than years) and you can observe in frequency channels that are difficult (if not impossible) to use from the ground. Both of these features, multiple frequencies and larger sky coverage, are necessary to ultimately demonstrate the ‘cosmological nature’ of the signals we’re looking for – to show that it’s not just a signal from some foreground in our local galaxy and that it has the required statistical properties across the sky we expect from proposed theories. As shown in the below gif, SPIDER can observe a large fraction of the ‘clean’ sky (the white outline) for 20 days and get nearly the same sensitivity over that region as a ground based experiment like the BICEP2 project had on their smaller region (green outline) after several years of observation. 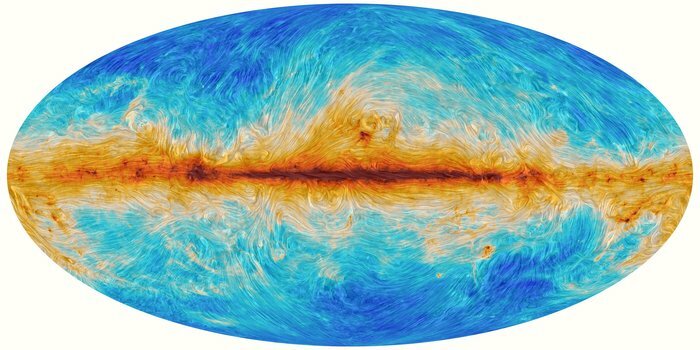 A map of the dust intensity seen in the sky, the bright center band the emission from our own Milky Way galaxy. The overlay that is fading in shows several things: The colored diamonds show the most recent data about the *polarization* strength of the dust signal, blue being less polarized dust, the outlines on the overlay show the regions observed (or to be observed shortly!) by BICEP2 (green), POLARBEAR (red), and SPIDER (white). Ok, so that’s why we want to dangle our instrument from a balloon. But why Antarctica? Why don’t we just launch our balloon from New Jersey? Well, for one, at some point, we need to bring the instrument back down to Earth, and that involves literally letting it fall to the ground so that we can recover it. That’s why scientific payload balloon flights only happen in places with low population density. In the US, payloads are flown out of Fort Sumner, New Mexico. They used to fly out of Palestine, Texas as well. Payloads flown out of these locations are limited to flights anywhere from a few hours to a few days because they eventually start getting too close to population centers. Antarctica doesn’t have any population centers, so rather than being limited by distance, flights are limited by how long the balloons can stay afloat. Currently, that’s about 40 days. Beyond that, weather patterns setup circumpolar winds during the austral summer here. So if you launch a balloon at the right time, it’ll come back close to where it started, making recovery of the instrument easier (it takes about a week to ‘boomerang’ back around). This is especially important for an experiment like ours since we need to physically recover our data off the drives that fly with the instrument. The bandwidth of in-flight communications limits us to only getting a small fraction of the data from the instrument during flight. One of the many ballooning challenges is to make the system as autonomous as possible so minimal human intervention based on the limited information we decide to ‘downlink’ to the ground is needed. The other fundamental challenges of ballooning that make this a very different game from ground-based experiments I’ve worked on: weight and power constraints. Having to fly the batteries you need to power the experiment, the solar panels to keep them charged, the cryogenic system to keep the everything cool and all the readout and control electronics systems while still staying below the maximum mass limits current balloons can float makes a project like this a fun problem to solve. The absence of day-night cycles during the austral summer in Antarctica helps address the power and weight constraints by giving us a continual source of solar power. This means we only need to fly a few heavy batteries to provide a non-variable power source and we can dedicate more of our mass budget to the scientific instruments. More compromises have to be made when designing payloads to fly at mid-latitudes, where enough batteries need to fly to power the payload throughout the night. There are many advantages to these mid-latitude flights though: larger available sky and longer (100 day!) flights with NASA’s new, soon-to-launch-with-science-payloads super pressure balloon platform (SPB). Spider is a balloon-borne instrument designed to search for the signature of primordial gravity waves that is (hopefully) encoded in the polarization of the CMB. The design consists of six independent telescopes operating at three frequencies (100, 150, and 220GHz), with the optics cooled to 4 Kelvin and the bolometric detectors cooled to 0.25K. Spider’s first test flight will be in the fall of 2009, from Alice Springs, Australia. The test flight will be 2-4 nights duration, limited by the requirement that the balloon be brought down before it leaves the continent. The full “around the world” flight will be a year later, if all goes well. “Spider Optimization: Probing the Systematics of a Large Scale B-Mode Experiment”, C. J. MacTavish etal, arXiv:0710.0375, submitted to ApJ. (This discusses Spider’s potential systematics and scan strategies). In addition to the effort at Case, the Spider collaboration includes groups at Caltech, JPL, U. Toronto, UBC, NIST, Cardiff, and the Imperial College of London. 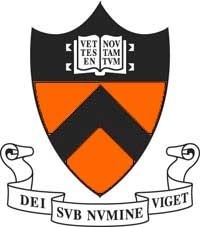 The main SPT website is maintained at Caltech, at http://www.astro.caltech.edu/~lgg/spider_front.htm. 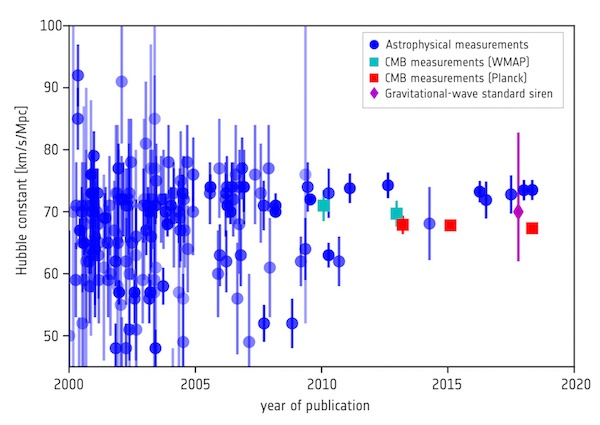 Earlier this year, the BICEP2 experiment shook up the world of cosmology, announcing that they had detected gravitational waves originating from before the Big Bang! Not only did they announce this, but they announced that they had done so with a signal in excess of 5σ, which is regarded as the gold standard for a detection in physics. 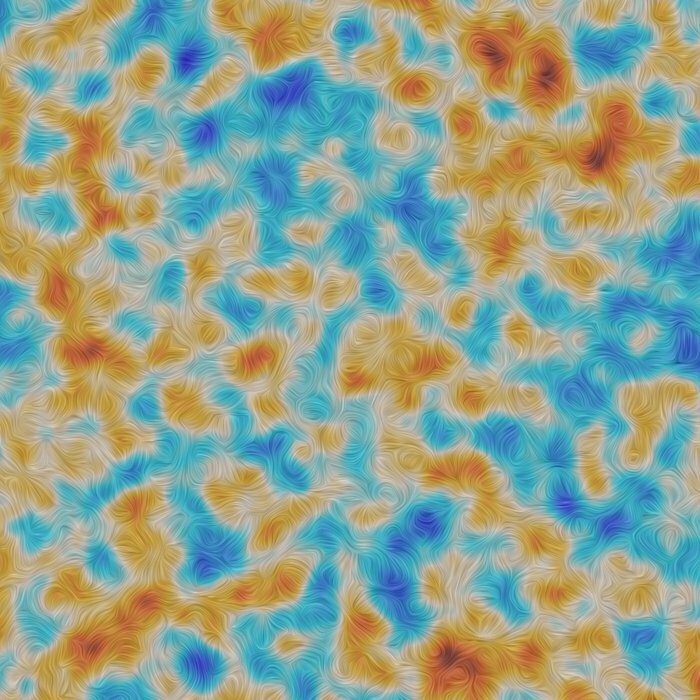 Image credit: BICEP2 Collaboration — P. A. R. Ade et al, 2014 (R). But this may all turn out — despite the hoopla — to be absolutely nothing. Or, as it were, nothing more than a phantasm, as the observed signal may have originated from a source as mundane as our own galaxy, and have nothing to do with anything from billions of years ago! How did we get into this mess, and how do we get out of it? The answer to both questions is “science,” and it’s a great illustration of how the process and the body of knowledge actually evolves. Put your preconceptions of how it ought to work aside, and let’s dive in! 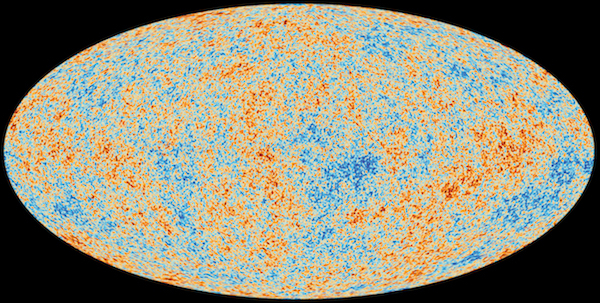 This is a snapshot of the cosmic microwave background (CMB), the leftover glow from the Big Bang, as viewed by the Planck satellite. 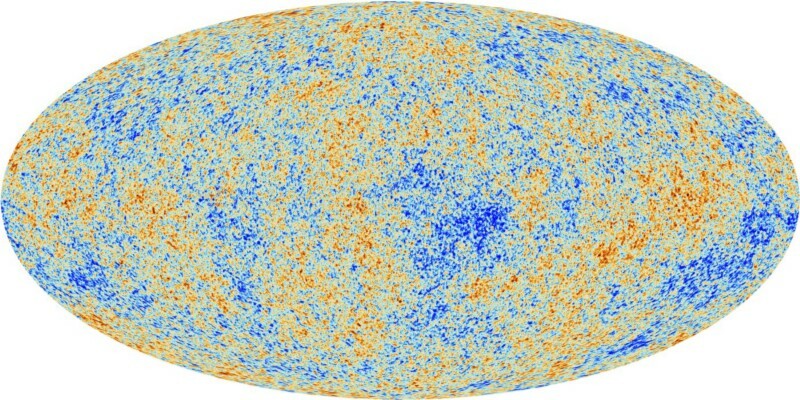 Planck has the best resolution of any all-sky map of the CMB, getting down to resolutions smaller than one tenth of a degree. 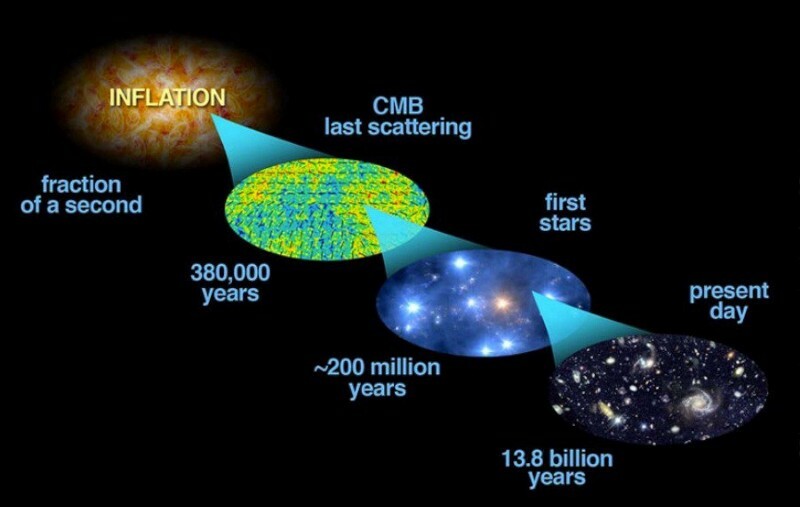 The temperature fluctuations are minuscule: on the order of just a few tens of microKelvin, less than 0.01% of the actual CMB temperature. Image credit: Wikimedia Commons user SuperManu. 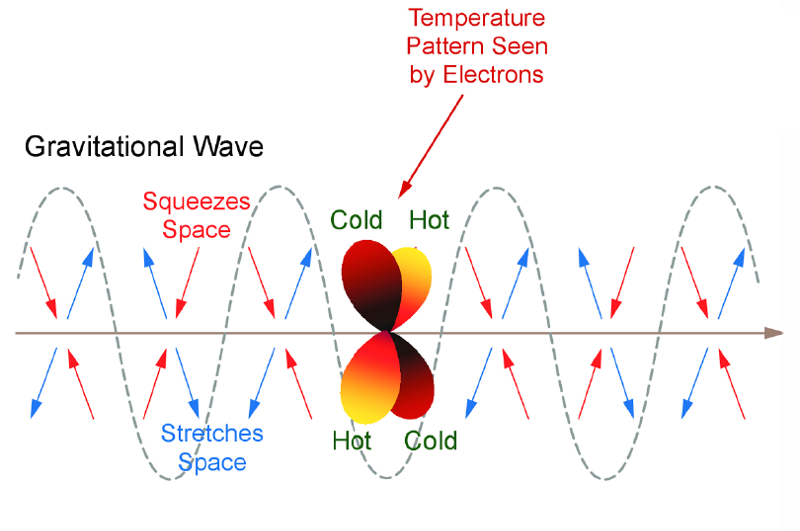 But buried in this signal is another, even more subtle one: the signal of photon polarization. 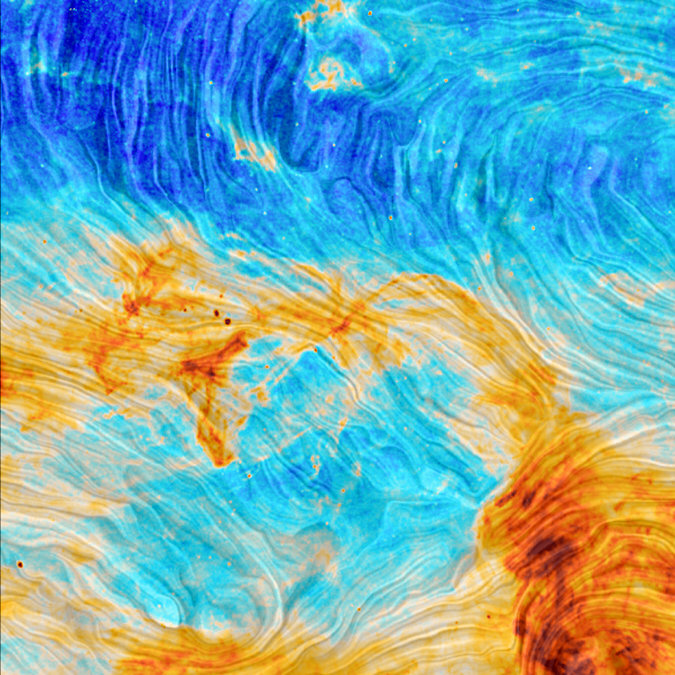 Image credit:the BICEP2 collaboration, via http://www.cfa.harvard.edu/news/2014-05. Basically, when photons pass through electrically charged particles in certain configurations, their polarizations — or how their electric and magnetic fields are oriented — are affected. 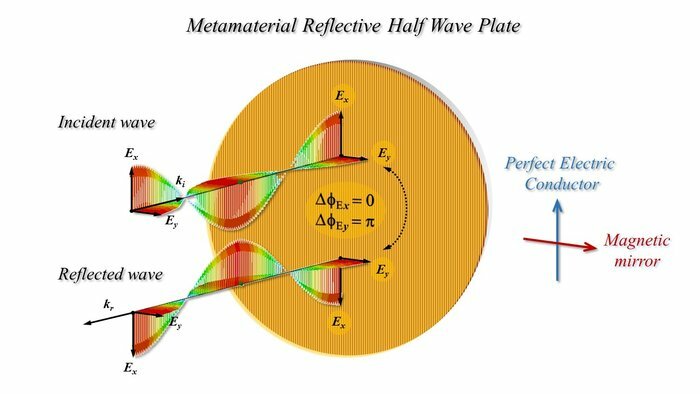 If we look at how the two types of polarization, the E-modes and B-modes, are affected on a variety of angular scales, we ought to be able to reconstruct what caused these signals. Images credit: Amanda Yoho [Upper]; http://b-pol.org/ [Lower], of an E-mode polarization pattern at left and a B-mode pattern at right. A portion of this signal, in addition to charged particles, could also originate from gravitational waves created in the early Universe. 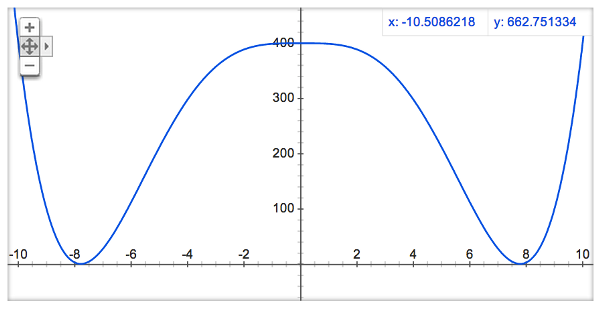 There are two main classes of models of inflation that give us a Universe consistent with what we observe in all ways: new inflation, which was actually the second model (and first viable model) ever proposed, and chaotic inflation, which was the third model (and second viable one). Images credit: two inflation potentials, with chaotic inflation [Upper] and new inflation [Lower] shown. Chaotic inflation generates very large gravitational waves, while new inflation generates tiny ones. 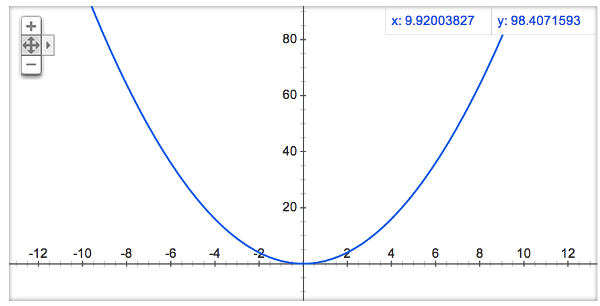 Generated by me, using google graph. These two models of inflation make vastly different predictions for gravitational radiation: new inflation predicts gravitational waves (and primordial B-modes) that are extraordinarily tiny, and well beyond the reach of any current or even planned experiment or observatory, while chaotic inflation predicts huge B-modes, some of the largest ones allowable. These signatures have a characteristic frequency spectrum and affect all wavelengths of light identically, so it should be an easy signal to find if our equipment is sensitive to it. And that’s where BICEP2 comes in. 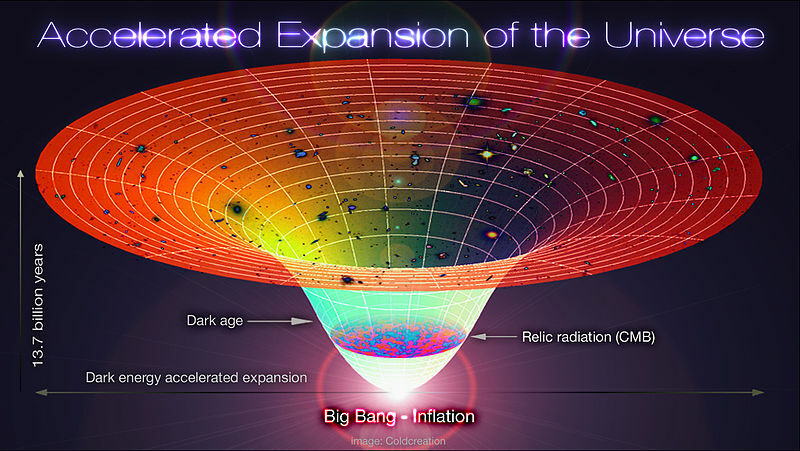 Image credit: Sky and Telescope / Gregg Dinderman, via http://www.skyandtelescope.com/news/First-Direct-Evidence-of-Big-Bang-Inflation-250681381.html. Rather than measuring the whole sky, BICEP2 measured just a tiny fraction of the sky — about three fingers held together at arm’s length worth — but were able to tease out both the E-mode and B-mode polarization signals. And based on their analysis of the B-modes, which was very careful and very good, mind you, they claimed the greater-than-5σ detection. What this means is that they had enough data so that the odds that what they were seeing was a “fluke” of having observed just a serendipitous patch of sky was tiny, or a one in 1.7 million chance. Flukes happen all the time at the one-in-100 level or the one-in-1,000, but one-in-1.7 million flukes… well, let’s just say you don’t win the lotto jackpot very often. But there’s another type of error that they didn’t report. Not a statistical error, which is the kind you can improve on by taking more data, but a systematic error, which could be an effect that causes what you think is your signal, but is actually due to some other source! This type of error normally goes undetected because if you knew about it you’d account for it! This is exactly what happened a couple of years ago, if you remember the “faster-than-light-neutrino” business. An experiment at CERN had reported the early arrival by just a few nanoseconds of thousands upon thousands of neutrinos, meaning that they would have exceeded the speed of light by something like 0.003%, a small but meaningful amount. As it turned out, the neutrinos weren’t arriving early; there was a loose cable that accounted for the error! 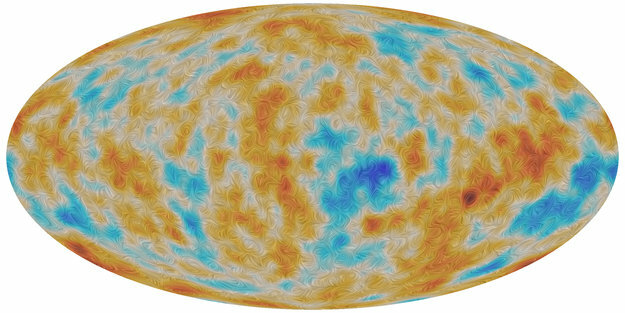 Image credit: ESA / Planck Collaboration, via http://www.mpa-garching.mpg.de/mpa/institute/news_archives/news1101_planck/news1101_planck-en-print.html. 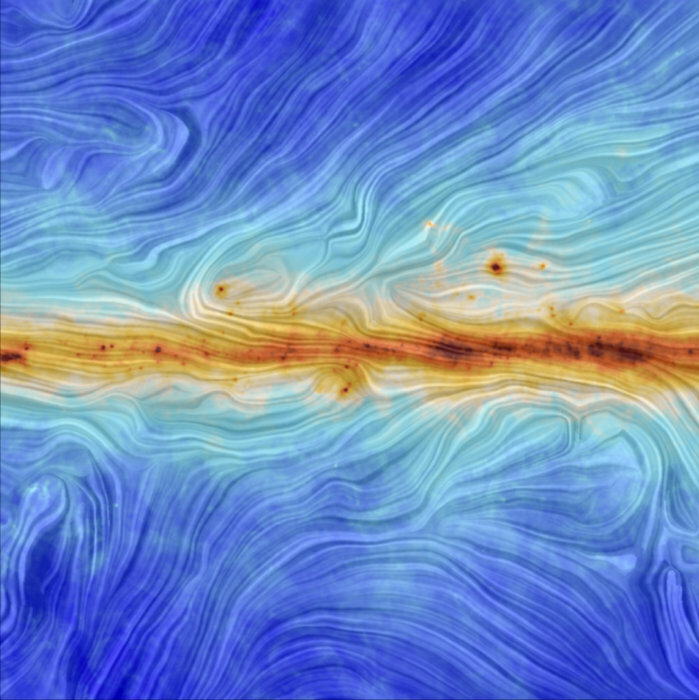 Well, one of the things the BICEP2 team didn’t measure was the galactic foreground emission. Polarized light — including light that contains these B-modes — gets emitted by the Milky Way galaxy, and that can contaminate your signal. 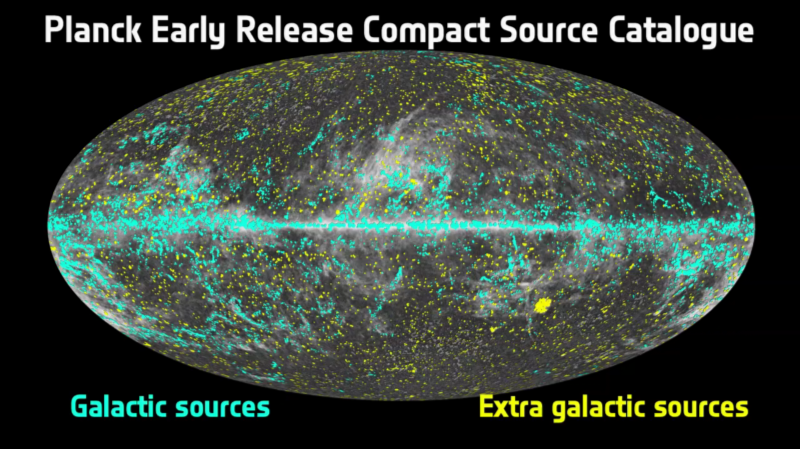 The BICEP2 team used a very clever trick to try and eliminate this, by interpolating unreleased Planck data about galactic foregrounds, but when the Planck team actually released their data, the foregrounds were significantly different from what BICEP2 had anticipated. And with the new Planck data, the announcement of a “discovery” needed to be walked back; the evidence was now something like a one-in-200 chance of being a fluke. Image credit: John Kovac, viahttp://cosmo2014.uchicago.edu/depot/invited-talk-kovac-john.pdf. In other words, although gravitational waves could have caused this signal, so could other, far more mundane sources, including just our boring old galaxy! 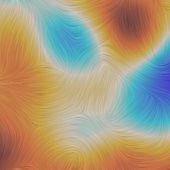 Sometime later this month, the Planck team will release their all-sky polarization results, and either at that moment or shortly thereafter, we’ll find out whether there really are gravitational waves from inflation that can be detected with our current generation of telescopes, satellites and observatories. We’ll find out whether chaotic inflation is right, or whether we need to keep searching for the gravitational wave signal from before the Big Bang. We already have the density fluctuation signal, so we can be confident that inflation happened. It’s just a question of which type. Image credit: Bock et al. (2006, astro-ph/0604101); modifications by me. Stay curious, stay hungry for more knowledge, but always demand that your scientific claims be independently verified, that your possible systematic errors be checked, and that you have overwhelming evidence before believing the extraordinary claims. It’s easy to make a bold statement; it’s hard to start a bona fide scientific revolution!